I hope you all had a nice week! I ended up taking an unintended blog break. Busy times! My teapot card was originally going to use LAD Sketch #70, but I ended up getting a bit off track. Anyhow, the notecards are from A Muse, and the teapot is from Tea Time (Lizzie Anne Designs). I thought the colors were kind of fun and different together. The teapot is colored with Copic markers and matches the notecard much better IRL. This next project is a wallet that I made from an Orange Juice carton. I found the instructions in the Februrary Family Fun magazine. It was fun to make something a little different. I need to try the projects in the Family Fun magazine more often. My son turned 8 yesterday, and today we will be celebrating his birthday (as well as my daughter's), with our parents. I imagine it will be a very busy day, but I hope to catch up with you all real soon. Have a lovely weekend, and thanks for stopping by!! 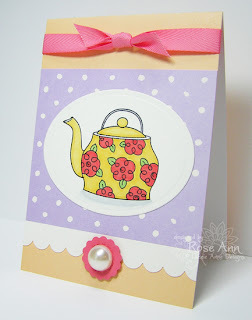 I absolutely love your teapot card, Rose Ann! Fantastic layout and the colors are so SPRING! What a cute wallet! Don't you just LOVE paper?! That's really neat. Happy B-day to your kiddos! Oh so darling Rose Ann, love your work. I love the card but the orange juice wallet is amazing!!! Hey breaks are a good thing... Relax and enjoy the day!! What fun, cheerful colors- perfect for that adorable teapot image. What a clever idea someone had with the little purse. A friend and I were just saying how we used to make our Barbies furniture and accessories out of common household items but today with all the things available to buy, little girls are not encouraged to use this type of creativity! ha! an orange juice carton-how cool. Love your teapot too. hope you enjoyed your break - Happy Birthday to the kiddos!! 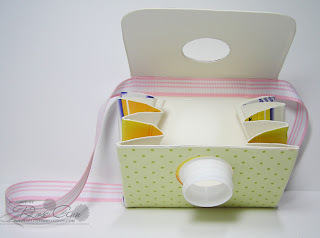 fabulous card and purse, such a great idea, love the altered juice carton, great recycling! Hope you have a fabulous weekend with your family celebrating birthdays! What a sweet teapot card! I love those colors together!! 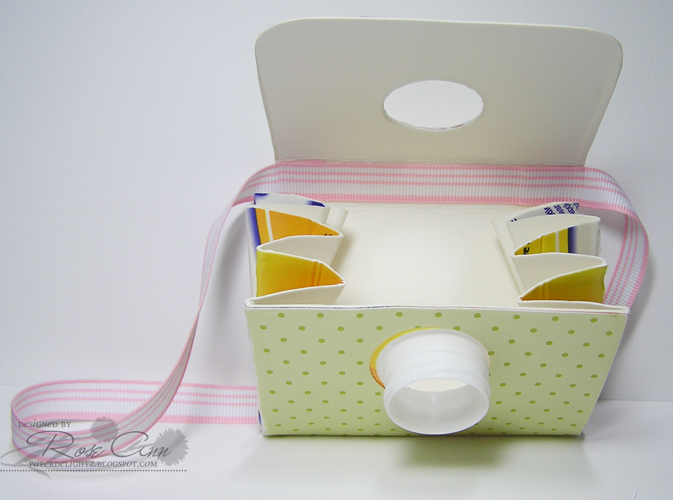 And how about that little purse made out of the juice carton! Just amazing!! Hope you guys had a lot of birthday fun! Celebrating birthdays is always a fun time! Hope the kids enjoy the parties!!! Your card and project are so cute! What a NEAT idea!!! Your teapot card is just darling! Love the large pearl. And your wallet card....ultra creative and cool!! What a cool idea for that purse! Great job! Your teapot card is darling Rose Ann - I love it!!! And, that orange juice carton purse is amazing!!!! I really think it's a cute project!!!! Hope you are enjoying your weekend, happy birthday to your son! Oh my WORD! Check out that SUPER COOL wallet!! Awesome! ...and I'm LOVIN' the color combo in your card. So fresh and springy!! Such a sweet, sweet card Rose Ann and that purse is just ADORABLE! I think I saw that article. . .your purse is awesome! A very pretty card. I'm inspired now to buy that Tea Time stamp set. But I'm thinking that it might be a wee bit difficult to pour a cup of tea from the teapot you have pictured in your card. Take another look at it. LOL! Oops...the joke's on me. I just noticed the handle ON TOP of the teapot. I was expected a SIDE handle and it just didn't look right! Forgive my empty head, Rose Ann. The wallet is adorable! I would love to make one for my nephew, sans ribbon of course! 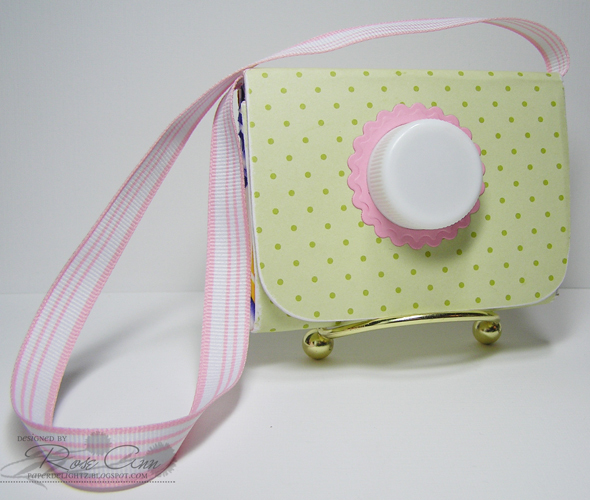 What amazing projects, Rose Ann...the little tea pot is sooo cute and how cool to make a wallet out of an orange juice carton....who woulda thought something like that would be sooo cute!!! I need to find that template, for sure!!! Oh, good heavens! Your teapot card is so cute with the polka dots and the pretty pearl brad, and your purse from an orange juice carton -- amazing!! Wow!! How different and absolutely adorable. You're always coming up with something different and fabulous. A busy and creative gal! Oh my word! These projects are delightful! I just love your style with these ... and I generally feel inadequate with the soft tones ... Way to go! Beautiful card - and what a cute wallet! I saw it in Family Fun (can you bleieve I still get that magazine when my youngest is 15!) Great job on both! Very cute card! I love that little tea pot! And wow...an orange juice carton? That's fabulous!! Wow, how unique and adorable is that purse?! I love the colors..too cute! Your teapot card is so pretty and sweet too! Cute card,cool purse! Have fun with all the celebrations!!! What a great idea !! It looks so CUTE ! um wow! so cute love it. So fun! These are awesome projects. Family Fun has great ideas and you have such wonderful execution!!! What a fun wallet project! Happy belated birthday to your son! OH MY GOODNESS...I saw this and LOVE your execution, it is so COOL, Rose Ann.